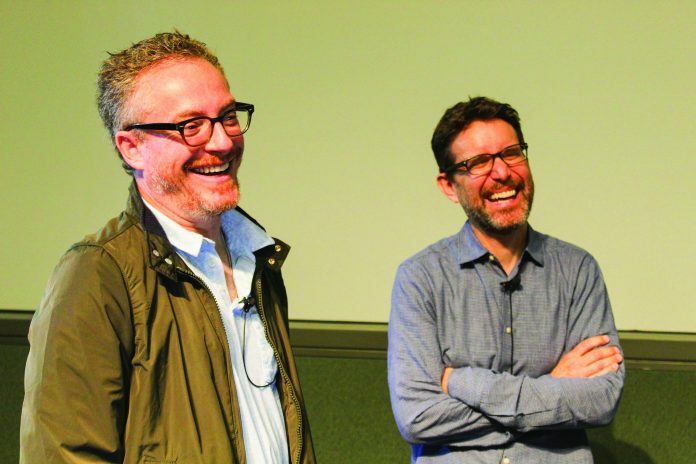 “If you can’t put it in another superhero movie, then you put it in ‘Deadpool,’” exclaimed co-writers and co-producers Rhett Reese and Paul Wernick at the “Deadpool 2″ screening and Q&A last Saturday at the Pollock Theater. The duo has also written “Zombieland” and is currently producing “Cowboy Ninja Viking” (starring Chris Pratt), but their pride and joy, the Deadpool franchise, has made the most so far, grossing over $1.5 billion worldwide. Reese and Wernick took huge creative liberties when writing the two record-breaking films. With this luxury, they got cameos from the likes of Brad Pitt and Terry Crews. They were even able to convince the studio to include a 10-minute X-Force scene that does not move the plot forward, something that movies are often advised against, but suits the style of “Deadpool” perfectly. Another fan-favorite stylistic aspect of “Deadpool“ is the soundtrack. Over the years, the co-writers, along with Reynolds, compiled a playlist that they felt fit the ironic and comedic tone of the film. Generally, the music supervisor or the director would select the songs for a film. Due to the success of the original “Deadpool“ soundtrack, however, the creators stuck to the same haphazard technique for “Deadpool 2″. Of course, the soundtrack was not the only unorthodox task the writers took on. An additional unique aspect of the “Deadpool“ experience was the screening process. The creators screened different versions of the film with different jokes included. With the help of microphones staged around the theater, they determined which jokes should be included and which should be omitted based on the audience’s laughter, or lack thereof. However, “Deadpool 2“ is as much a comedy as it is a dramatic, dark film. The bulk of the film depicts Wade Wilson, a.k.a. Deadpool, and how he deals with the death of his one true love, Vanessa. It was a difficult decision for the writers to make but, ultimately, they chose this storyline because “Deadpool works when you take everything away from him,” according to Reese. The goal of having Vanessa murdered was to make sure the “audience [felt] grounded,” as Wernick described, and so that the film “feels like real life,” as Reese detailed. Nothing is certain, but based off of extremely positive reactions to “Deadpool 2″ and the general buzz in the air surrounding every word that Reese and Wernick spoke during the post-screening Q&A at the Pollock Theater, it is hopeful. The audience hung on every heart-wrenching moment and each hysterical joke of the revolutionary Marvel film. Hopefully, there is more to see of Rhett Reese, Paul Wernick, and the renegade anti-hero, Deadpool.